The evolution has begun! 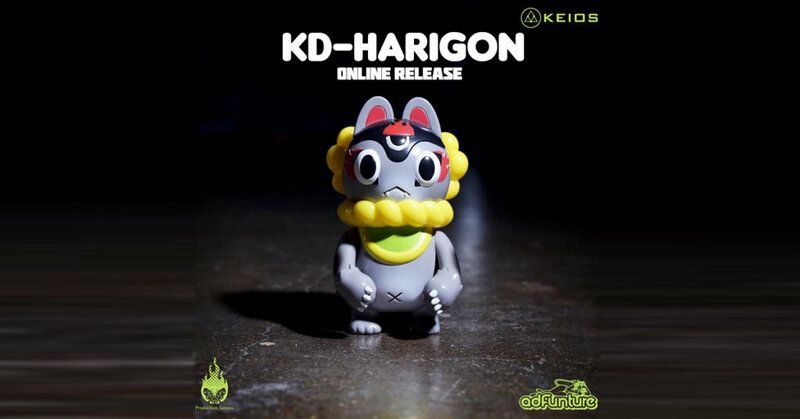 “INU-HARIGON” One of our personal Top Picks of 2016 FolkToy Kaiju Project’s from Teresa Chiba has evolved, meet KD-HARIGON a character Teresa designed for clothing brand KEIOS UNDER THE VEIL, then produced and issued by adFunture. The new character is a remix of Teresa’s infamous character INU-HARIGON and KEIOS’ three-eyed mascot KAYDEN. The grey coloured skin depicted in the original colourway reflects KAYDEN’s original character setting. adFunture has unleashed KD-HARIGON TODAY. To sweeten the deal, adFunture still has the FREE SHIPPING offer! It is also 13.5cm tall which is bigger than Teresa’s original INU-HARIGON Japanese figure.